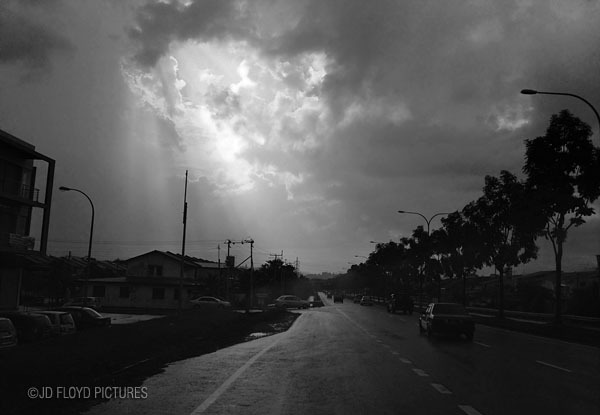 After a relatively long dry spell in Kota Kinabalu, it showered quite heavily today but only for less than 5 minutes. It disrupted a beautiful morning breakfast for many. It continued to drizzle and on my way to my base I stopped by the roadside to capture this using my phone camera. Somewhere along Kota Kinabalu - Penampang road. It reminds me of the Sinkhole I wrote about a couple of weeks ago. The morning sky was covered with cloud leaving only this 'hole' the clear path for the sun to shine. I wished I had my DSLR with me that moment. what phone did u use? it managed to capture the image beautifully. @doc - thanks. Secara kebetulan dpt scene mcm ni. @princess - iPhone. With the advance in the phone cam technology, there's a real contest between ordinary Compact camera and the phone as a carry-around camera.